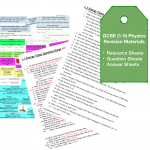 All our resources support the new 1-9 Grade GCSE specifications for the major exam boards (AQA, OCR, Edexcel). The printable resources are downloadable in PDF format, ready to print and hand to your students. Students should be engaged by the work in front of them, regardless of gender. Our resources are written to be as visually and cognitively appealing to girls as to boys. They are not, however, resources ‘for girls’. The cover lesson resource sheets are so easy for my staff to use for setting cover, and the students really enjoy using them too! I wish we'd had these when I was doing my GCSEs.